Naslovnica / Groza: Sodnik v Veliki Britaniji zavrnil starše in ukazal uboj njihovega bolnega otroka! Velika Britanija je država v kateri vlada kultura smrti. Ne samo, da izvajajo LGBT radikalno indoktrinacijo otrok in njihovo spremembo spola in spolne usmerjenosti, tokrat s sodnimi odločbami odrejajo uboje bolnih otrok. Starši so ustrahovani in nemočni pred abortivno vlado. 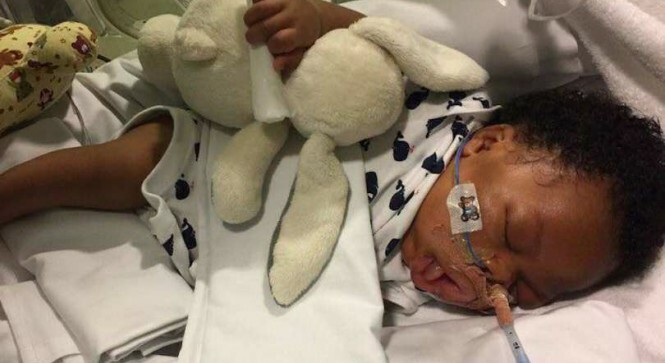 LONDON, England, January 31, 2018 (LifeSiteNews) — A English judge ruled that an 11-month-old boy must die, ignoring his parents’ wishes to keep him on life support. Justice Alistair MacDonald of the High Court decreed that keeping Isaiah Haastrup alive was “not in his best interest.” His parents, Lanre and Takesha, urged Kings College Hospital to keep their child breathing. The 11-month-old lost oxygen when he was born, resulting in brain damage. The boy is barely conscious and needs a machine’s help to breathe, but he is not in a coma. His mother, who wants to take Isaiah home to care for him, says her son reacts to the sound of her voice and the touch of her face. Takesha disagrees. Isaiah “definitely has an emotional connection to me” when she cuddles and bathes him. “When I call his name, I say, ‘Isaiah, it’s mummy,’ he will also give me a response by opening his eyes,” she said. She says she has seen Isaiah move his head and thumb, and blink. She says she can tell he enjoys being rocked. Conversely, the experts say Isaiah has no “purposeful” responses. The judge decided Takesha’s testimony of her son’s responsiveness was “influenced by the flattering voice of hope” and unreliable. Isaiah is “without meaningful awareness of his surroundings” and “has no prospect of recovery or improvement,” he concluded. In effect, Lanre and Takesha feel the court has determined that a severe condition can cause an innocent human life to be not worth living. Isaiah’s plight adds to the debate about doctors and judges deciding whether a child lives or dies, regardless of the parents’ wishes. Last summer, disabled newborn Charlie Gard’s parents wanted to take their son to the United States for experimental treatment, but Great Ormond Street Hospital successfully blocked them and Charlie died in July.